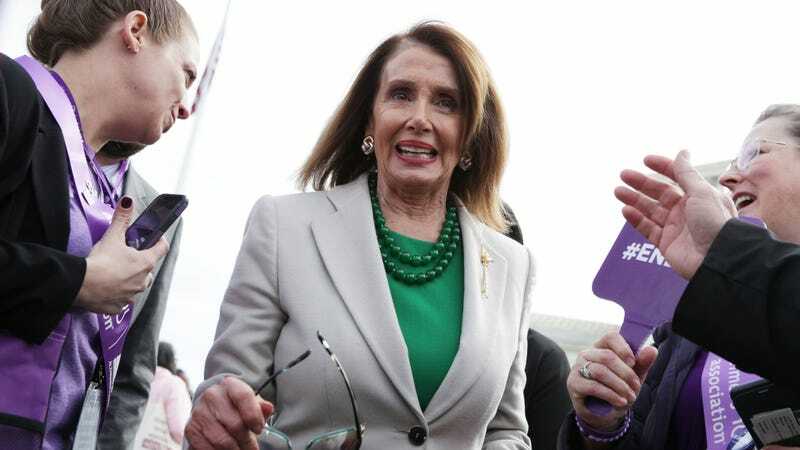 Nancy Pelosi does not appear to be particularly impressed with Alexandria Ocasio-Cortez. On 60 Minutes this past weekend, Nancy Pelosi dismissed the growing left-flank of the Democratic Party, Ocasio-Cortez included, as “like five people.” She continued to write off Ocasio-Cortez this week, claiming a “glass of water” could have won her district if it ran as a Democrat. Jesus. “When we won this election, it wasn’t in districts like mine or Alexandria’s. And she’s a wonderful member of Congress, I think all of our colleagues will attest,” Pelosi, a California Democrat, told an audience Monday night at a London School of Economics event during a U.K. visit. “But those are districts that are solidly Democratic. This glass of water would win with a D next to its name in those districts,” she said, picking up the water at her table. In June, 29-year-old Ocasio-Cortez unseated 19-year-incumbent (and Pelosi buddy) Joe Crowley, and while it is true her district has historically been solidly Democratic, it’s not insignificant that a young, relatively obscure democratic socialist managed to pull off that kind of upset. And though it’s true that some districts won’t go for progressive Democrats, the establishment’s continued insistence that there’s no real place in the party for the left just ensures that there won’t be. Pelosi’s argument is that the Democrats need to keep to the middle until Trump’s out, and while that strategy makes sense on its face, the playbook has failed in the past. Americans are starting to embrace universal programs like Medicare-for-All. They have voted for real progressives like Ilhan Omar and Rashida Tlaib, cementing the party’s small, but vocal left wing. Things are changing, slowly but surely. Still, the establishment will keep to the script. “[O]ur message, our progressive message, is down the middle,” Pelosi said, though she’s fine with Ocasio-Cortez and co. continuing to “[r]each for the moon,” at least rhetorically, until the Dems take back the White House. Meanwhile, if you’re curious to see how a glass of water performs in an election, I have some good news for you.